Musicians everywhere start bands and dream of moving the world with their songs. But how many have done so in the face of such formidable odds as the Refugee All Stars? Like many of their countrymen from the West African nation of Sierra Leone, drummer Rueben M. Koroma and guitarist Franco Langba fled to neighboring Guinea to escape the ravages of a brutal civil war. "We were in the Sembakounya refugee camp," recalls Koroma. "Franco had an old acoustic guitar. And we had a dream that we would make our own group with the objective of de-traumatizing the people from the psychological wounds of the war." Unfortunately, the wounds weren't only psychological. The warring Sierra Leone factions murdered thousand of civilians, and the rebels adopted the grisly practice of hacking hands and arms from anyone they perceived as a political opponent. In fact, two members of the All Stars, vocalists Abdul Rahim Kamara and Mohammed Bangura, suffered that fate. If all of the musicians create powerful music that can move people in a positive way, that will be very nice for the world! But better things lay around the corner. American filmmakers Zach Niles and Banker White, working in tandem with Alfonse Munyaneza of UNHCR, the U.N.'s refugee agency, were traveling the camps to film a documentary on how refugees keep their spirit and culture alive through music. "When we came to the last camp on our itinerary," White recalls, "we asked about musicians, and people pointed us to a little bar with thatched siding and a tarp roof. The band was inside playing the reggae song that became the title track to their album, Living Like a Refugee. They'd applied for a small business micro-loan from the camp under the name Refugee All Stars, and they'd acquired a small P.A., a gas-powered generator, a makeshift drum kit, and some guitars. The cymbals were old hubcaps. The drum skins were whatever plastic material they could find. But they were writing incredible songs and entertaining the people around them." As ultimately documented in the film The Refugee All Stars, the musicians returned to Freetown, Sierra Leone's capital, to cut an album in a small studio powered by a gas generator. The recordist was Sam Jones, a U.K.-raised Sierra Leonean who'd returned to his homeland in 1993. The album they created is an infectious mix of deep reggae groove and lilting African pop. 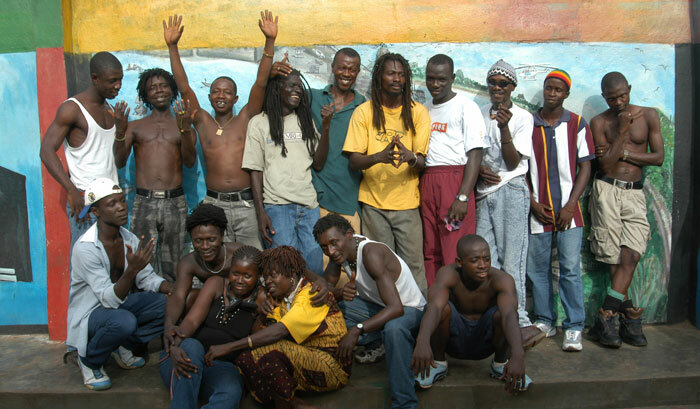 A cornerstone of the band's sound is the Sierra Leonean style known as goombay. "Goombay is the traditional music in our country," explains Koroma, speaking by phone from Freetown. "They play it at weddings and baptisms and many other festivities. It's acoustic music played with hand drums and mouth organ. The other style you hear is called palm wine music. It's a combination of acoustic guitars and traditional percussion. We have adapted goombay and palm wine music to western instrumentation, with electric bass and drums." Buoyed by the success of the documentary on the indie film circuit, the Refugee All Stars recently made their first visit to the U.S. to perform at the South by Southwest music conference in Austin, Texas. Rueben says it was an eye-opening experience: "I'd never seen an escalator! We don't have them in our country. It was a problem for me to step on and off at first, but I think I know how to do it now." But more significant, says Koroma, were his cultural experiences: "I'd never heard so many musicians playing so many different types of music. We met so many musicians from many different parts of the world. They admired our music and accepted our culture, and we learned to accept their culture. Hearing new music helps you understand the culture of another man." The band also started breaking in some new instruments in Austin. Yamaha recently outfitted the group with donated gear, including a Maple Custom drum kit, an S90ES keyboard, and a BBT500H digital bass amp. "We're honored to assist these courageous and hard-working musicians," says Chris Gero, corporate director of Yamaha Corporate Artist Affairs. "The Refugee All Stars are a true testament to how music can transform your life and help you transcend even the worst of circumstances." Now the musicians are back in Sierra Leone, where the populace is preparing for the first presidential elections since hostilities ceased. "Freetown is very calm," reports Koroma. "When we first returned in 2004, we heard reports of armed robbery, shooting and looting, but now we're not hearing of any crime." Meanwhile, Rueben says he's doing what he always does: "I'm always working on music. Music is part of me. And I say this to all my fellow musicians around the world: If we all create powerful music that can move people in a positive way, that will be very nice for the world!" You can purchase Living Like a Refugee and find out more about the Refugee All Stars documentary at www.refugeeallstars.com. All proceeds from album sales go directly to the band.